As the 1950s gave way to the 1960s the African National Congress (ANC) and Pan Africanist Congress (PAC) both announced plans to tackle the pass laws for blacks (both men and women) with massive protests, civil disobedience and pass burnings. There was a sense of rivalry between the two organisations to get their campaigns off the ground first. Suddenly the country was rocked by the events of 21 March in Sharpeville where people had gathered to show the police that they did not have their passes – and thus to invite arrest. In the general confusion and escalating tension of the situation, police shot and killed 69 people. World headlines condemned this callous example of unwarranted police repression against unarmed Africans. Predictably, and almost immediately, there was a government crackdown of all black opposition. In a single stroke the national liberation movement was stopped (temporarily, at least) in its tracks and the Congress Alliance was plunged into disarray. The government declared a state of emergency, hundreds of arrests were made and in April 1960 the ANC and newly-formed PAC were banned as lawful political parties. Both organisations were driven underground. By mid-1961 Congress leaders had come to the realisation that non-violent methods of resistance had failed and would have to be abandoned; the ANC and PAC both established military wings - Umkhonto we Sizwe and Poqo respectively. The new strategy was to turn to violence, to try to harm the economy and to gain publicity for the fact that the ANC was still a viable organisation despite being banned. The banning of the ANC in 1960 threw the Federation of South African Women (FSAW) into a hopeless position. It had been conceived on the 1950s model of resistance and it was doomed to flounder in the 1960s. It had not been banned but its ally, the ANC, had been driven underground. The immediate goal was to try to regroup. Its most prominent female leaders, Ngoyi and Joseph, had been detained. Some went into exile and worked for the ANC, such as Ruth Mompati, for example, who became secretary of the African National Congress Women's League (ANCWL) in Tanzania in 1962. Similarly, Hilda Bernstein escaped to London and became a member of the External Mission and the ANCWL. Those who remained in South Africa, however, were hamstrung because their FSAW structures were no longer in place. By September 1961 the FSAW had made enough ground to hold a reasonably well-attended national conference in Port Elizabeth and Lilian Ngoyi and Helen Joseph were re-elected. Ngoyi was upbeat in her report and her reminder that freedom was not easily won. Nevertheless, bad times were near at hand. In October Ngoyi was banned and confined to Orlando for 5 years. Florence Matomela of the Eastern Cape section suffered a similar fate, and in early 1962 there was worse to come. Helen Joseph's banning order expired but she was served another within a few months, becoming the first person to be confined to house arrest. With the loss of its three main leaders there was no chance of revival. In 1963 the Congress of Democrats (COD) was banned which was another blow for many politically active women. In the next few years more of the leading women were removed from office in the organisation by government orders and arrests. The list included, among others, Albertina Sisulu, Mary Moodley, Amina Cachalia, Liz Abrahams and Bertha Mashaba. In 1965 Ray Alexander went into exile in Zambia. By the mid-1960s the FSAW had declined into obscurity. However, the spirit of women's resistance had not been destroyed. As Walker puts it ‘After a period of apparent dormancy in the late 1960s – the result of the massive crackdown of the previous years – women began to regroup in the 1970s' (Walker 1991:275). The Black Consciousness ideology is not the issue here, so suffice to say that its adherents rejected white partnership and sought to emphasise and promote black self-esteem and assertiveness. The movement came to prominence in the 1970s, but the first significant group to identify with Black Consciousness principles was SASO, and it held its first conference in 1969. These black students were studying under very difficult circumstances in university campuses and it is unlikely, although not impossible, that there were many women students among them. Certainly Mamphela Ramphele began her medical studies at the University of Natal in 1967 (where Steve Biko began his in 1966) and it was here that she met and fell in love with Biko, who became the leader of the Black Consciousness Movement. She too was a member of SASO and shared his political convictions. In the 1970s a women's organisation inspired by the Black Consciousness Movement, the Black Women's Federation, was formed in 1975. Zainab Asvat was by no means the only Indian woman who had a high political profile at the time. 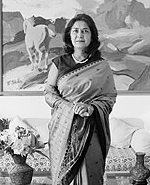 The following year (1964) another prominent Indian women, Amina Cachalia, was banned for five years for her role in the FSAW. Later on, in 1966, Phyllis Naidoo was banned and detained for ten days for breaking her banning order. Soon afterwards she left South Africa for Lesotho, where she subsequently became the victim of a parcel bomb. There is a great deal of information on women’s internal political activities or protests against racial discrimination and unjust laws in South Africa, but not much has been written on the history of women activists in exile. This section deals with both high and low profile women in exile during the struggle. It is imperative to note that the banning and the consequences of banning political organisations such as the African National Congress (ANC), the Pan-Africanist Congress (PAC) - who both had taken up anti-pass campaigns in 1960 - and the South African Communist Party (SACP) in the same year were momentous. One of the most significant impacts of the bannings was the subsequent decline of the liberation movement after the Sharpeville Massacre in 1960. In an effort to resuscitate the war effort, thousands of people, of which a large number were women, (i.e. women activists and spouses of male activists) left the country for various destinations in Africa and Europe. Ever since that date, support for the ANC began to grow from strength to strength. In the ensuing decade the explosion of student unrest and the crackdown by the government in 1976 further drove thousands of students into exile, among them young girls. After Soweto, many young men and women who went into exile joined guerrilla armies (i.e. Umkhonto we Sizwe/MK). A relatively smaller group followed other professions. The former category was housed in ANC bases in Zambia, Tanzania, Angola and other African countries. In these bases, female youths, just like their male counterparts, carried out various activities under very trying conditions. In exile, women were involved in multi-tasks. For example, most women exiles had to find work and they worked alongside men in anti-apartheid structures. They were mainly split into four diverse groups. On the one hand, there was a wiser category of women who went out as nurses, teachers and musicians (i.e. Letta Mbulu and Miriam Makeba). The latter was based in London and often depicted or symbolised women’s role in the arts. Makeba, who in 1959 had starred in the anti-apartheid documentary Come Back Africa, showed her dedication to the struggle when in 1963 she made an impassioned testimony before the United Nations Committee Against Apartheid. Consequently, her records were banned at the same time as the South African government revoked her citizenship and right of return. In the face of this development, she stayed in the United States (US) and married Stokely Carmichael, a Black Panther leader. Thus her exile from her South African homeland started. Undeterred in her pursuit of political activism, three years down the line, she received the Grammy Award for Best Folk Recording together with Harry Belafonte for An Evening With Belafonte/Makeba - an album leased in 1966, which dealt with the political plight of Black South Africans under apartheid. She stayed in exile in countries such as Guinea and Belgium before the former president of South Africa, Nelson Rolihlahla Mandela, persuaded her to return to the country in 1990. On the other hand, there was the unknown number of women (e.g. those without qualifications or specialised skills). These worked at all levels of the MK movement. There were also women like Agnes Msimang, Sabi Foreman, Sherley Gunn and Ruth Carneson, who performed big and responsible roles as the liberation struggle progressed. Still others, based in front line states, acted as couriers. As already indicated, women in exile included students and professionals such as teachers and nurses. Most of these women played an important role in women’s groups which were formed since the 1960s. For instance, by 1965, the ANC had established a Women’s Section Bureau in Tanzania, with office-bearers including Ruth Mompati, Mary Ngalo, Edna Mgabaza and Florence Mophosho. Members of the Women’s Section had suffered enormous hardships, many having to choose between motherhood and political duty. A number were forced to leave babies behind when they went out of the country. Their loyalty to the movement, their strength and commitment to the national struggle led the ANC to review the role of women in exile. Although the organisation officially commemorated Women’s Day on 9 August, it acknowledged that it had not made full use of the leadership capabilities of women. The author of one official document reflected, “It sometimes seems that the ANC has not forgotten that the woman’s place is in the kitchen, and very often unconsciously places her there.” To address this issue, the organisation made sure that women became equal partners in the External Mission and were used “in direct political work as full members in all spheres and phases.” The ANC leadership created conditions for women in exile to take the initiative in contributing to the broader liberation struggle. The first task of the Women’s Section Bureau was to establish contact with all women in exile, wherever they had settled, as well as those who remained in South Africa. The London office was especially useful in this regard, and the effort was designed to overcome the crippling sorrow of estrangement from home. Welfare work was at the core of the Women’s Section Bureau’s responsibilities from the outset. Many families in South Africa had been left without breadwinners because of imprisonment, execution or exile. The Bureau assisted by establishing links with organisations, including anti-apartheid non-governmental organisations (NGOs) that could offer material help to such families. In June 1965, the Bureau was represented at the second Afro-Asian Women’s Conference in Cairo and two years later participated in the international Voice of the Women conference in Montreal (Canada). Conference themes included independence and security for all countries, the crisis in Vietnam, national liberation, disarmament, non-violence and education for peace. Clearly, the Women’s Bureau was not only concerned with apartheid but also with the Vietnam War and discrimination in general. In 1968, Mary Ngalo was appointed to the Women’s Bureau of the Afro-Asian People’s Solidarity Organisation (AAPSO) after her husband was transferred to Egypt by the ANC. She played an active role in the activities of this organisation until her sudden death in Cairo on 16 March 1973. In October 1970 Mompati, a trained MK cadre, and Gusta Hildgard, also a member of MK, attended the Women’s International Democratic Federation (WIDF) Council and Bureau meeting in Budapest, from where Hildgard went on to East Berlin for a two-week course in military affairs arranged by the WIDF for its affiliates. One of the other things that we did was to attend women’s conferences. We were invited by women all over the world. I attended conferences in Sudan, Nigeria, Ghana, Mali, West Africa, Guinea Bissau and then Guinea Conakry. It was very difficult to travel sometimes in Africa, particularly to Kenya. We had no passports. We used papers that we got from Zambia and Tanzania; we used to call them Freedom Charters. Nevertheless, although women filled various roles during the struggle, their story cannot be complete without documenting their trials and tribulations in the camps particularly at the hands of some unscrupulous officers. Women activists in camps and organisations faced a multiplex of problems. For example, they were subjected to serious forms of harassment (mostly sexual harassment) and discrimination. Due to sexual harassment and other forms of impermanent relationships children were produced, thereby forcing the liberation movements to set up schools for the children born in exile. Mompati and Gertrude Shope recalled that the Women’s Section made concerted efforts to provide a measure of support and counselling for abused female cadres and teenagers confronted with unwanted pregnancies. These escalated with the arrival of the 1976 generation. According to Mompati, issues involving sexual relationships were always an area of concern. Although it has been stated that commanders implicated in such practices were removed from their posts, these problems existed. ANC National Executive Committee (NEC) member Gertrude Shope said the ANC Women’s League had taken action when these abuses were brought to its attention. For example, a delegation had visited the various camps in Angola to meet the women and discuss their problems. Similarly, former MK intelligence chief, Ronnie Kasrils, now deputy defence minister, stressed that the MK had great respect for women. He said, “Any abuse of women that took place was not part and parcel of everyday occurrence. This is something that would have been hidden. When it was brought to our attention that certain abuses were taking place behind the scenes we took action.” In spite of these sentiments, however, abuse was quite commonplace. As a result of such problems, the ANC’s regional political committee in East Africa published an undated memorandum about unacceptable social behaviour. The document identified three rampant problems – alcohol abuse, smoking marijuana and sexual relationships. The authors of the document believed that these were political rather than moral issues, arising from specific social conditions and holding definite political implications, both for the immediate phase of the struggle and for the future of a liberated South Africa. For the ANC this behaviour was not compatible with the task of winning freedom “for our people.” In the main, the document analysed the persistent issue of sexual relationships in three categories: exploitative, irresponsible and promiscuous. While acknowledging the complexity of the issue, the authors argued that there were definite negative trends that were incompatible with the liberation struggle. For example, exploitative sexual relationships conducted by those who abused their positions of power, were censured as “one of the very worst forms of exploitation and hypocrisy.” Equally, the document called for the eradication of the use of threat or force to secure sexual favours, because “this kind of behaviour destroys comradely respect and trust and undermines the organisation.” Despite the stout efforts made by the Women’s Section Bureau, however, such problems and other internal dynamics continued to undermine the ANC throughout the exile period. It is clear that South African women in exile suffered insurmountable hardships in their quest to bring freedom to the country. Indeed, exile meant that homes were broken up when women joined the struggle; children were left helpless and uncared for; mothers were separated from their babies when they joined the struggle; women and young girls were exposed to humiliation and degradation at the hands of army commanders, instructors and administrators who frequently sexually molested them. The forthcoming holiday which marks the 53rd anniversary of Women’s Day should ponder over some of these atrocities in addition to commemorating the women’s famous protest march that ended at the Union Buildings, Pretoria on 9 August 1956 against the imposition of pass laws.